This potato leek soup recipe calls for zero milk or cream and still provides a creamy smooth texture. Served chunky or smooth this meal is sure to be a crowd pleaser. Since this recipe doesn’t use any dairy it has become a favorite for those who are lactose intolerant but would still like to enjoy a tasty yet creamy bowl of soup. It is another fantastic way to reduce calories yet still maintaining full flavor and body. This homemade soup is a recipe that pleases the appetite for both types of soup textures. Whether you prefer a chunky style meal or a smooth pureed texture you can accomplish both with this tasty dish. The potato leek soup recipe below outlines making both the chunky and smooth textures and if you wish you can puree only half the pot of soup making two styles from one batch. This can be very handy when you are trying to please everyone. For this reason alone this homemade soup has become one of my favorites. 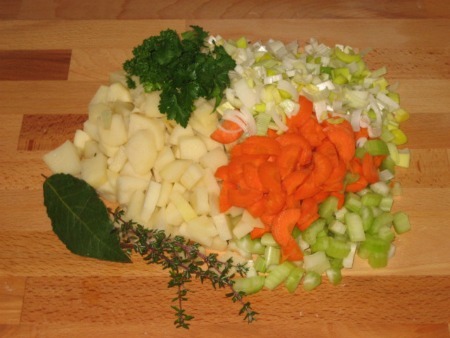 In a large soup pot melt butter on medium high and add the potatoes, carrots, leeks, celery, thyme, bay leaf and a pinch of salt and pepper. Saute the vegetables for about 6-8 minutes over medium heat. Now add the chicken broth and water﻿. Turn on high heat until ingredients come to a boil, then reduce heat to low and simmer covered for about 20 – 30 minutes or until vegetables are soft. Add salt and pepper to taste. For a chunky soup, leave as is, but if you prefer a smooth pureed texture then it must be blended. For a creamy textured meal puree the soup in batches in a food processor or blender. If you have a hand held immersion blender you can puree the ingredients directly in the pot. Make sure the soup has cooled enough before blending to avoid the possible spatter of burning hot soup on the skin. Take a little extra time to wash leeks thoroughly because leeks grow in layers and most times the dirt hides easily between the layers. The only way to make sure that the leeks are free from dirt is by separating and washing all the leaves before chopping them to size. As usually, never fear if you do not have any chicken broth handy. Though using broth does give homemade soup that extra flavorful zing, you can substitute the broth with water and add 2 chicken bouillon cubes and it will still be an amazingly healthy and tasty meal. You can make both the chunky and creamy style meals from one batch. Just puree only half of the ingredients giving your family and guests the choice of two styles. Now that is handy and smart.